Upset: Wong (left) with SNTD member Alvin Chin who is holding up a copy of the 2012-approved EIA report on the proposed Dash highway route. THE 2012 Environmental Impact Assessment (EIA) report on the proposed Damansara-Shah Alam Elevated Expressway (Dash) showed that parts of the proposed route were less than 15m away from the residential areas in Damansara Perdana. This was revealed by residents action group Say No To Dash (SNTD) spokesman Michelle Wong after a group of residents met with Selangor Mentri Besar Azmin Ali late Tuesday evening. 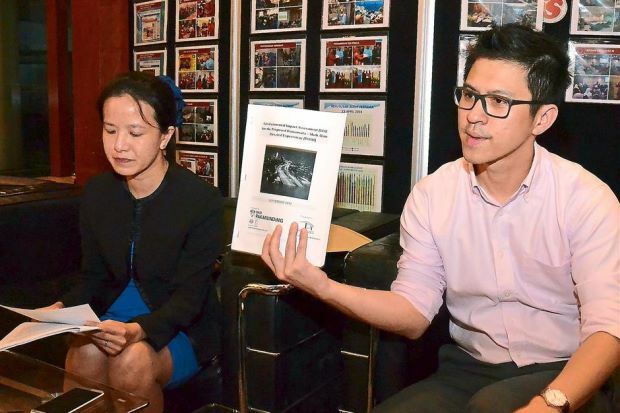 She said Damansara Perdana residents had asked for the EIA from Bukit Lanjan assemblyman Elizabeth Wong, as well as other relevant documents such as the 2012 and 2013 land acquisition gazettes. Michelle said the EIA had failed to distinguish Mutiara Damansara (PJU 7) from Damansara Perdana (PJU 8), with both areas mentioned interchangeably and the findings also seemed to apply to both. Michelle and four SNTD members met with Azmin for about 30 minutes. “The assessment showed that none of the more than 24,000 Damansara Perdana residents had been included in the surveys, and the sample size was only 165 people from several areas along the proposed route. “We told the Mentri Besar that we would not accept any mitigation measures such as sound/dust barriers, as the highway would be cutting through an already densely-populated area,” she added. According to the SNTD spokesman, Azmin had informed the group that he wanted to meet the residents before meeting up with Dash concessionaire Prolintas and the Malaysian Highway Authority about the highway in question. During the meeting with the group, Michelle said Azmin assured that he would push for a new EIA because the last study was done in 2012 and the neighbourhood had grown since then. On the matter of the Freedom of Information Enactment request for Selangor Economic Action Council’s (MTES) minutes regarding Dash, Michelle said the matter had also been brought to state assembly Speaker Hannah Yeoh, who would bring it up at the next Select Committee on Competency, Accountability and Transparency hearing after Christmas. SNTD member Abu Bakar Mohd had filed the Freedom of Information Enactment request for the minutes back in October, but this was never fulfilled. Dash is estimated to cost RM4bil and the proposed route starts from Puncak Perdana U10 through Alam Suria, Denai Alam, Kampung Melayu Subang, Rubber Research Institute Malaysia, Kota Damansara, Mutiara Damansara and Damansara Perdana before linking to Sprint and Damansara-Puchong Expressway (LDP).